The new SINZ Membership platform features a state of the art, smart phone based scanning system that allows you to check into the club quickly, discreetly and automatically helps you accumulate Gold Member benefit points. Your member card reveals no personal information, it is simply a generic bar code of the member number visible beneath the code. No personal information is recorded concerning your attendance, only the number is entered. Once scanned the door person will know your member level (Gold or Basic) and if you have prepaid for the event. (Remember Gold Members can prepay online without fees). Here is the easiest way to find and use your card remember the following instructions MUST be completed on a smart phone or tablet, not a notebook or PC. 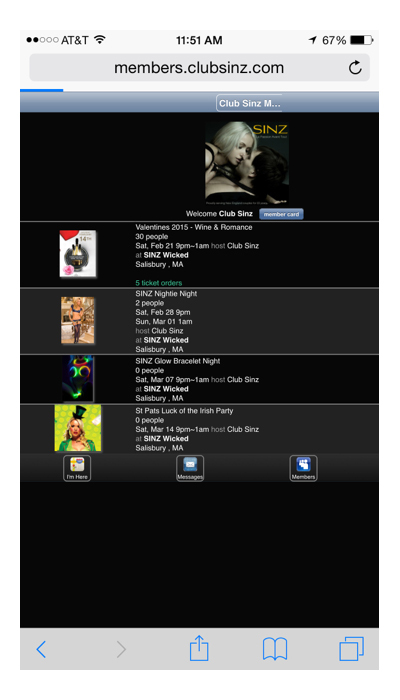 Once you are logged in you will be taken to your member account page where you will see a list of upcoming events. Immediately below the SINZ logo you will see a button named Member Card. This is what you hold up to be scanned at the door. While you have this opened, lets create a shortcut by taking a screen shot of the card. This way you can simply pull it up from your photos and you won’t have to login everytime. First you might want to make it a little bigger and center on the barcode. Flip your phone to landscape mode when you do this. On most Android phones, you can take a screenshot by holding down the Sleep/wake button and the volume-down button simultaneously. Hold these buttons down until your screen flashes. The process differs on some phone models, though. For example, on Samsung’s Galaxy phones—and select phones from other manufacturers that feature a home button—hold down the power button and the home button until the screen flashes, as pictured above. If your Android phone has a home button, and if the standard Android method doesn’t work, then try this power-home button combination. Remember that when you are logged in you can perform lots of other actions as well. Full account management, ticket buying, event schedule and member browsing are supported on the mobile Member Services platform. What if I don’t have a smart phone? If you don’t have a smart phone you can use a tablet (ipad or android) to lookup your membercard and record your member number, this can be entered by the door person at the club. If you don’t have any ‘mobile’ devices, simply contact us at info@clubsinz.com from your registered email address and we will send you a digital image of your member card. IMPORTANT REMINDER – Never reveal or share your member card or member number with anyone. Your member number identifies you uniquely. It is against club policy to allow non-members or other members entrance to the club using your number. As your number is unique it is also used as part of your account security should you contact us for questions related to your account.